What? I can't hear you... 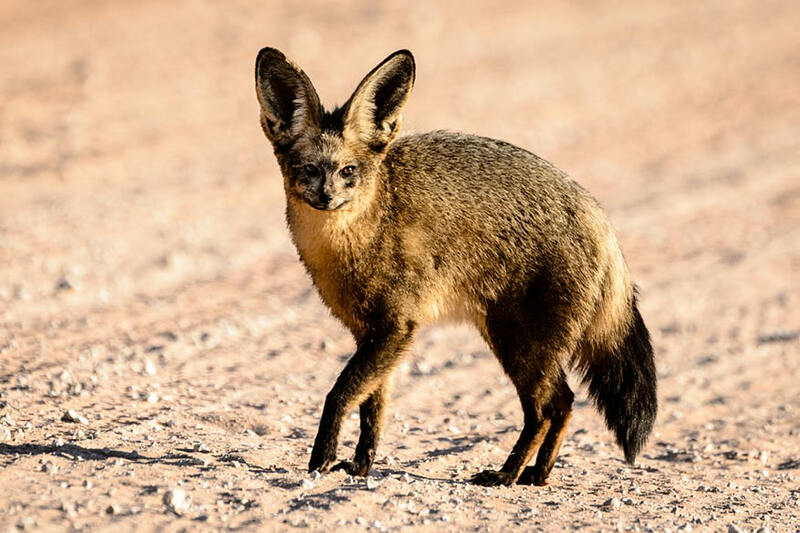 The bat-eared fox is number one of Serengeti's 'Weird 4' animal list. Everyone wants to see the famous big 5. Once you’ve ticked those off, keep an eye out for Serengeti’s ‘Weird 4’: the most unusual, rare and spectacular animal in all of Africa. Be camera-ready at dawn to spot these tiny nocturnal foxes seen throughout the park with a crazy ear-to-head ratio. They live on insects, especially termites, and live in small groups. When they aren’t foraging they’re quite docile and will sit still nicely for a snap to add to your collection. Basically Bambi, this is the smallest and by far the cutest of the antelope species in the park and looks like it would be cannon fodder for the big cats; but its diminutive size is its secret to survival, enabling it to tuck away behind tufts of grass and graze in relative safety. Their name comes from their ‘dik-dik’ alarm call. With a mating display to rival the flamboyance of a peacock, the grey crowned crane’s dancing, hopping and bowing mating performance, coupled with its long neck and striking gold crown of fine feathers and flashes of red on its face, makes it the real showman of the plains. It’s not all lions, leopards and cheetahs you know – there are other cats just as beautiful in the Serengeti to tick off. Take the serval – big, black spots and ears the size of its head that it uses to detect rodents and other small prey at night. Last April the Tanzania Association of Tour Operators (TATO) launched the multi-million dollar Serengeti De-snaring Programme, teaming up with Tanzania National Parks and the Frankfurt Zoological Society to get rid of the wire-based traps used to harvest bush meat, which indiscriminately target anything that happens to get caught in them, including elephants and lions. “The team has discovered 384 animals trapped in snares of which about 100 were released alive,” says project manager Erik Winberg of the Frankfurt Zoological Society. As of mid-October, the project has removed 7331 snares.